Having been privileged enough to be born into a family with big fishing traditions, I have always fished. For as long as my memory extends, I can't remember a time when I didn't fish. In my very early teens I discovered an old copy of sea trout fishing by Hugh Falkus in my grandparents home and after very quickly digesting it cover to cover I became instantly captivated by the images his writings created in my imagination. Growing up on the south side of Dublin, meant a lot of my fly fishing skills were honed on the humble river dodder on evenings after school. I can remember as though it were yesterday, the first time the sea trout Hugh Falkus had created in my mind crashed into life out of a murky evening in Ballsbridge, when I stumbled across the small but underestimated sea trout population the dodder supports. From that moment on my fascination with perusing sea trout and with their mysterious life cycle was galvanized. Fast forward a few years and I find myself living on the east coast on the Wexford/Wicklow border. The corresponding section of coastline luckily has so far escaped the clutches of intensive salmon farming and consequently has several rivers with healthy populations of migratory trout. 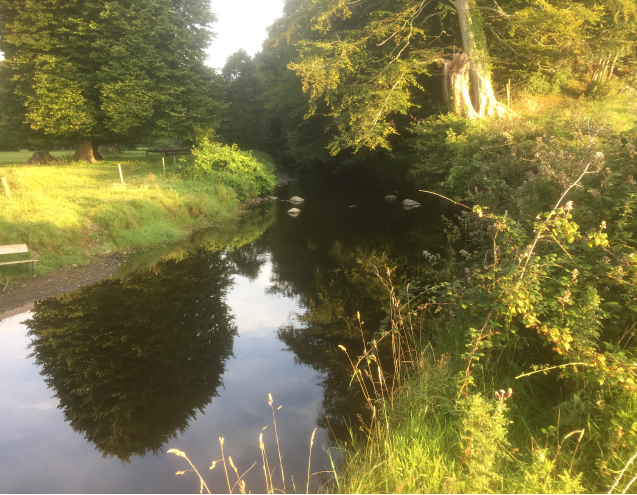 The fast flowing, stoney rivers with relatively low productivity around here are perfectly suited to supporting large populations of sea run Browns. 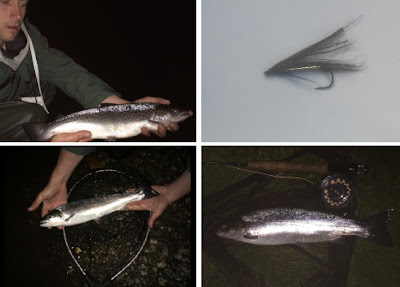 The main rivers south of Dublin are, the Dargle, the Vartry, the Avoca, the Ahare, the Ounavarragh and the slaney all of which I've been lucky enough to have access to, as well as many other small streams that support sea trout in varying degrees. My 2016 sea trout season has thankfully started as I would like it to proceed with a few lovely trout finding their way to my net. Last night (24th June) I made my way to one of my favourite beats on the small but not to be under estimated river Vartry. Unlike later in the season when finnock often occupy every available lie, the larger fish that run early on, tend to travel in small pods intent on their upstream progress and only resting in prime lies. Consequently knowing the water your fishing is vital if you are to succeed. On the beat I was fishing there is a large "turn pool" which has carved its shape out of a fifty foot high sandbank under a Woodside on the north bank and a manicured cattle pasture on the south bank. The narrow neck of the pool forces the river to speed up and scour downwards to depths of 10/12 ft then widening out into a pool that resembles a small lake, slowly shallowing to a gravely tail out. The depth this pool has, coupled with the overhanging trees and under cut banks makes it a top holding pool for sea trout. Generally I have two sets of tactics for sea trout in rivers, 1. Muddlers or small wets in shallow pools. OR 2. Larger wets or streamers fished slow and deep. The later always produces the bigger fish for me. As I sat waiting for darkness several fished showed around the pool, mostly in inaccessible spots under trees on the far bank but I knew it likely there would be good numbers of fish in this pool so I waited patiently. As my surroundings lost their definition I decided to tie up a small white muddler, it was a warm muggy night with loads of sedges and white moths about and there was a good chance of bringing trout up to the surface. I started at the neck of the pool and systematically worked my way downstream casting at 45 degrees and retrieving with a slow figure of 8. "Brown trout give themselves up to those who have skill, salmon to those who have money but the sea trout is a very different fish, to catch a sea trout you need soul"
Almost straight away I could hear the little splash of small resident trout and parr investigating my muddler occasionally punctuated by a loud plop or slurp of a curious sea trout but without the slightest contact with my fly. By the time I was half way down the pool I began to see a large disturbance in the tail out, which I credited to the helpful otter that had been travelling upstream with the sea trout since they began to run. This wasn't the first night mr otter had halted play of late and disappointed I reeled in. As I sat down on the bank, about to take out my phone and peruse done deal for more unneeded fly rods, I noticed the water had settled, maybe I had spooked mr otter I thought to myself. Not one to give up to easily I decided to tie on a wet and have another go. I picked out a long shank 6 that had tied myself, a silver tinsel body, blue hen false hackle, black Arctic fox wing with crystal hair overlaid with a few strands of peacock hurl and topped with a bit of teal !!!! I went back to the top of the pool and started to work my way down again, this time casting more at a right angle to the bank in an effort to get the wet a bit deeper and a slightly faster swing as the line straightens, still retrieving with a very slow figure of 8. As I went down the pool I could feel the odd tap and tickle at my fly which were more than likely curious parr. On just about my last cast, right in the tail out of the pool where I thought the otter had been my line stopped dead and before I knew it a large silver lump was hurtling through the air shattering the silence. After what seemed like about 20 crazy leaps when the fish stayed in the water long enough to run it stripped me nearly to my backing. A few hectic minutes later, a plump sea trout of about 3lbs was in my net. A quick photo and the fish dashed into the depths of the pool as quick as it had hit my fly. I rested the pool for about 20 minutes and then repeated the process, low and behold in nearly exactly the same spot I connected with a second fish, wen it came to the net it was a slimmer slightly smaller fish of around 2lbs. Satisfied with my achievements and mindful of the busy days work I had that was fast approaching I packed up and went on my way. 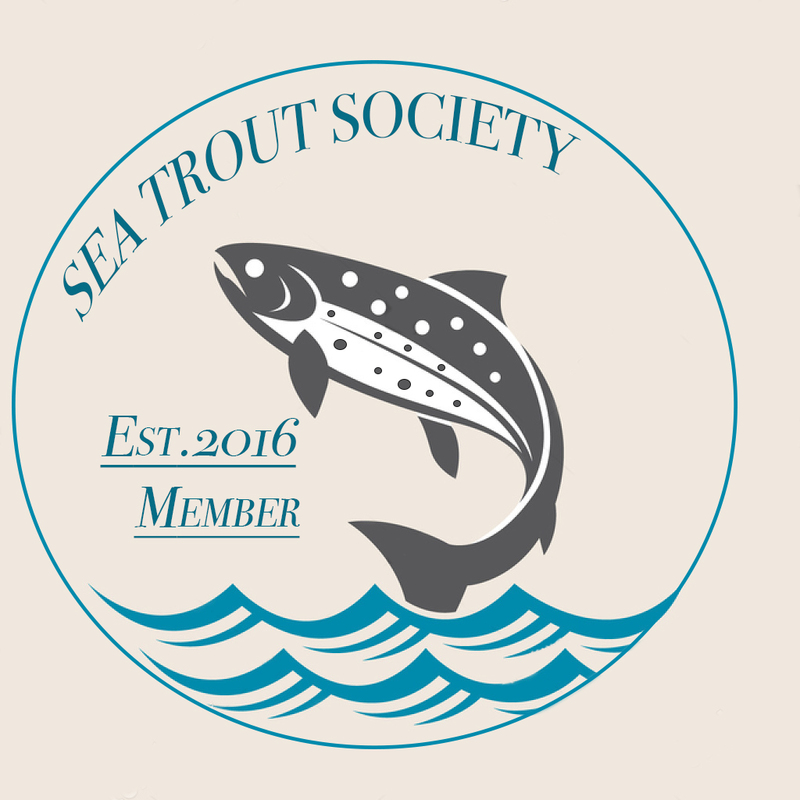 I regularly ask myself what it is about sea trout fishing that is so captivating and I regularly don't come up with an answer. But it's without doubt, once your are bitten by the bug of sea trout fishing there is no cure. Hugh Falkus (15 May 1917 – 30 March 1996), was a British writer, film maker and presenter, World War II pilot and angler. In an extremely varied career, he is perhaps best known for his seminal books on angling, particularly salmon and sea trout fishing; however, he was also a noted film-maker and broadcaster for the BBC. Hugh Edward Lance Falkus was born to James Falkus, a Surrey bank manager, and his wife Alice Maud. James retired early to a boat, first on the Essex marshes and then in Devon, upon which Hugh was sent to the East Anglian School, in Suffolk. According to his entry in the Oxford Dictionary of National Biography, Hugh caught his first fish when he was four, learned to shoot when he was six, and was an expert helmsman by the age of fifteen. By eighteen he had learned to fly, and at twenty he became a pilot in the RAF. On 11 July 1939 he married Doris Marjorie Walter, and they had two sets of twins (three sons and a daughter). The youngest son, Anthony, born in 1952, died in infancy. The older twins, Christopher and Malcolm, born in 1940, had successful careers, Christopher becoming a prominent publisher while Malcolm's career has been in economic history. Falkus' only daughter, Rowena Mary, is a Benedictine nun. In June 1940 Falkus' Spitfire was shot down over France and he spent the rest of the war in German prison camps, including Stalag Luft III the Great Escape camp. After the war he left Doris and in 1950 he married Diana Vaughan, the young editor of Argosy magazine, but on 12 May 1951 Diana was drowned, along with Charles Osborne, Bill Brendon and Sam Lee, in a boating accident off the coast of Achill Island in County Mayo, Ireland, while they were making a film about the local shark hunting industry. Falkus, a powerful swimmer, narrowly survived after swimming over a mile to the shore to seek help. In 1952 Falkus married Lady Margaret Vane-Tempest-Stewart, second daughter of the seventh Marquess of Londonderry, but the marriage was short-lived. 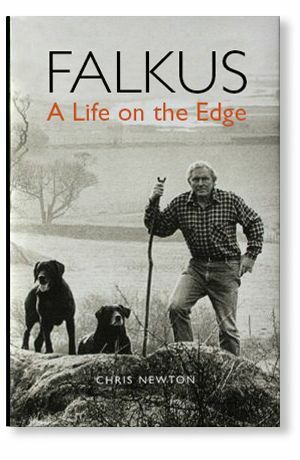 By 1955 Falkus had settled in Eskdale, Cumberland, which he had come to know and love through his friendship with Bill Fowler, a bomber pilot from Long Yocking, Eskdale, who he had met in a prisoner of war camp. In 1958 Falkus married Kathleen Armstrong, daughter of a local farming family. He lived with her at Cragg Cottage, Eskdale, for most of the rest of his life, writing about fishing and natural history and making television films on related subjects. He wrote, produced and presented a series of The World About Us films for the BBC, and with the Nobel Prize-winning zoologist Professor Niko Tinbergen he made a film about gull behaviour called Signals for Survival which won the Italia prize in 1969, and first prize for the BBC at the 1969 Montreux Film Festival. He was reportedly and according to his biographer, Chris Newton, a sexual predator, gaining the punning nickname "Huge Phallus" at the BBC. He was still having affairs in his late sixties, upsetting his friends by deserting Kathleen, his wife of 25 years for a woman named Romille. 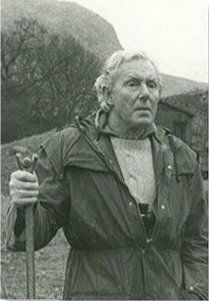 Falkus' masterwork Sea Trout Fishing, A Practical Guide (HF & G Witherby 1962, enlarged edition 1975) became a best-seller and has never been out of print; it "established his reputation as the father of modern sea-trout fishing" according to his biographer, Chris Newton. It was followed in 1984 by Salmon Fishing, a Practical Guide, also a best-seller which remains in print. Falkus was a controversial and outspoken figure, insisting on being right and bullying people. He was awarded the Royal Geographical Society's Cherry Kearton Medal and Award in 1982. Hugh Falkus died of cancer and bronchopneumonia at Cragg Cottage on 30 March 1996. His son Christopher had predeceased him, dying in 1995 of heart disease.